This week we started finishing our basement bathroom! We hired a friend of ours who's in construction to take care of everything and it's been so fun to watch the daily progress. If everything stays on schedule it should be completed by about the 9th of July, so we need this baby to stay put until then (and then not a day later!). On Thursday our neighbors (The Schusters) rented this fantastic water playground for their son's birthday party. Our boys had been counting down the days for over a week. They were so excited! And it seems with good reason. We try to make it to all of the Lowe's "Build and Grow" projects. 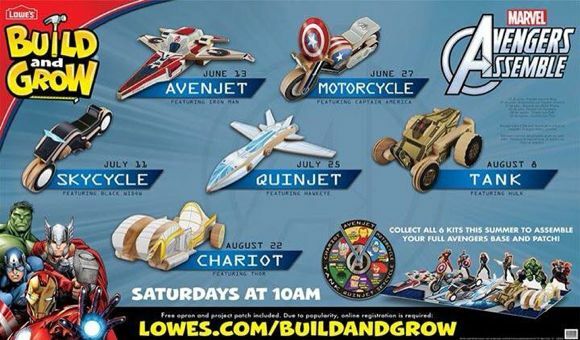 Yesterday the kids built Captain America motorcycles. Surprisingly the toys are generally very high quality. They still play with their wooden monster trucks they built months ago. Today we did our family hike at Bridal Veil Falls in Provo Canyon. It was less hiking and mostly just hanging out in the shallow pool of ice-cold water at the base of the falls. Maxine's overheated pregnant feet were in heaven. Not to be outdone by the flora, the fauna really shone! The kids loved the butterflies and fish.